Kerry said that the editor had particularly requested ‘a festive piece’ as the feature was due to be in the December issue. This was September, and Christmas wasn’t exactly front of mind. However, a walk in the woods gave me inspiration, and you can read more about the piece I produced shown on the right here. 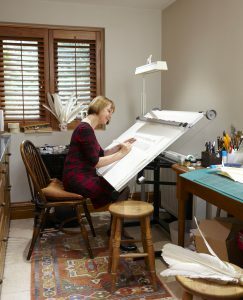 And here is the photograph Sussie Bell, the wonderful photographer, took of me putting the finishing touches to this piece. My workroom is a bit of a squeeze and so everything is crammed in. I didn’t have anywhere to remove all the stuff to, but before Kerry and Sussie came, I did have a bit of a tidy round and blew the dust off the tools and surfaces (and just for clarification, I make a lot of dust because I sand vellum skins!). 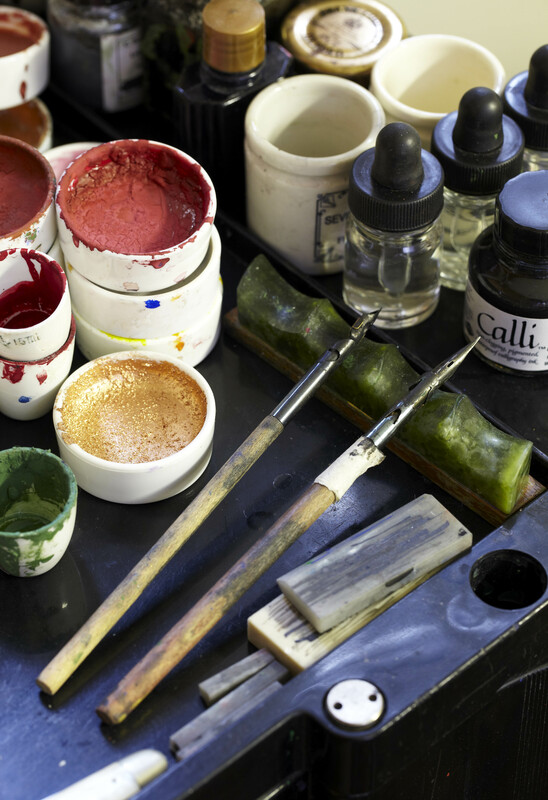 I have an artist’s trolley (now well over 30 years old!) 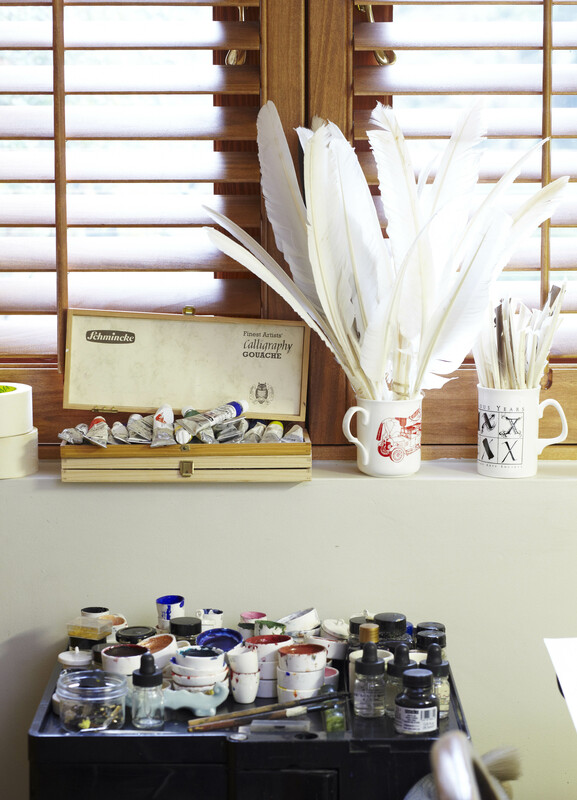 on my left-hand side which has paints, pen rests, the pens in current use, ink and sharpening stones on the top, and then other tools and materials in the drawers below. I’ve looked online for something similar, as I know that some of you may contact me and ask where I got it from, but it seems that ones exactly like this aren’t now available. 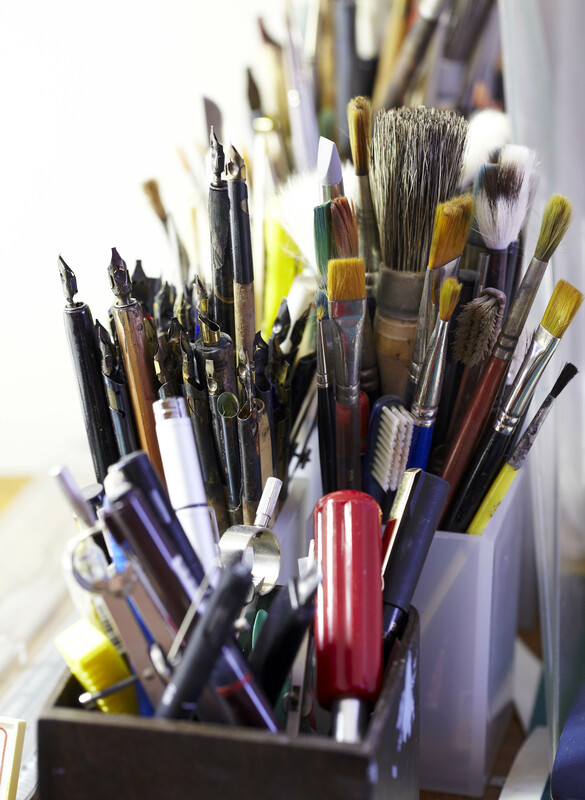 There are others, though, so put ‘artist’s trolley’ into a search engine for the range. This trolley really has been invaluable for me and the way in which I work. 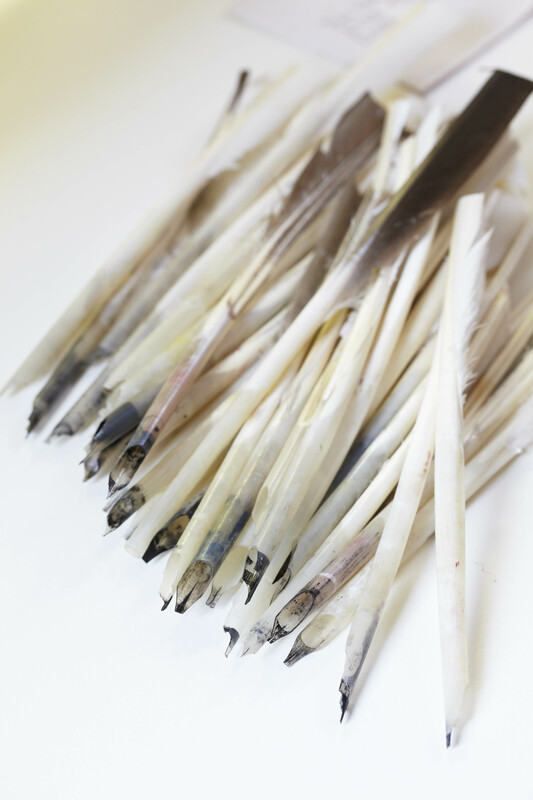 Feathers for quills and then cut quills are also to hand in pots, and for those of you who are interested, the very first Schmincke Calligraphy Gouache set is on the window sill. There is a special offer for subscribers to my newsletter on this, so if you want a set for £60 instead of the usual £96, subscribe to my newsletter (home page of this website) and then look here. This is the part of the trolley top closest to where I work with pens ready to use; Arkansas stones are piled up to sharpen nibs (never done this? The difference it makes to the sharpness of your letters will probably amaze you. 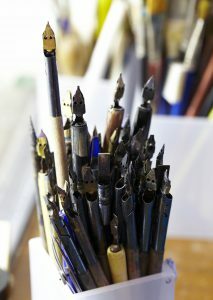 Look here at the free Calligraphy Clip on sharpening nibs). 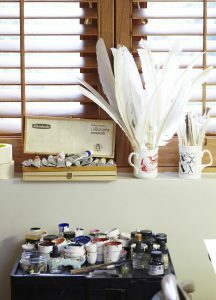 I use small crucibles a lot for paints as these are perfect for the amount of paint needed by calligraphers. 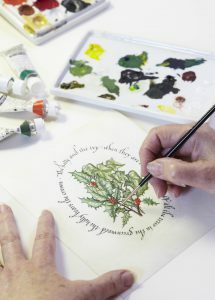 Again for the free Calligraphy Clip on inks and paints for calligraphers, click here. Find crucibles by putting ‘small white porcelain science crucibles’ into a search engine. Look around because some are very much more expensive than others! 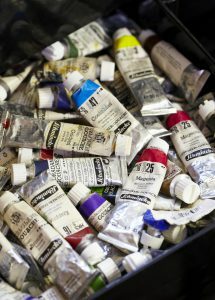 Other tubes of Schmincke paint are in the drawer in the trolley. There is no system here, so I rummage round to find particular colours if I’m being lazy about mixing them! 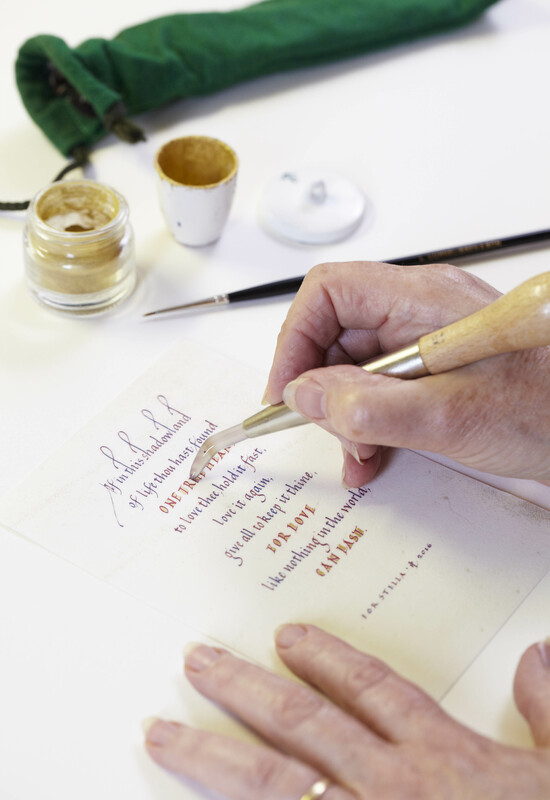 If you are interested in how to mix the paints of the Schmincke Calligraphy set to create no end of colours, again I have a free Calligraphy Clip here. Tools are all in jars on the right hand side. In my tidying up, I hadn’t noticed that I was cramming pens into the pen pot and one was sticking up rather a lot! I use pen holders that are quite small as my hands aren’t large; they are also a bit like using quills. I found these old wooden pen holders being chucked out by a school many years ago. 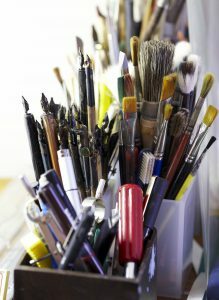 The rest of the tools I use most often are also in pots – erasers and sets of dividers, odd pens and a heavy duty knife nearest, brushes, ‘weird’ pens, brushes, quill knives etc further back. I was photographed finishing off polishing some shell gold on a vellum piece I had written using an agate dog tooth burnisher. Shell gold is in the crucible and in the little glass jar, and the green felt burnisher’s sleeve is at the top. 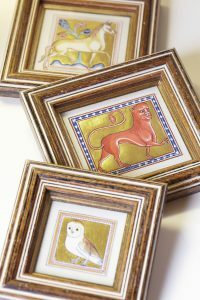 Kerry and Sussie seemed to love the copies of animals I had done from the Ashmolean Bestiary – using the traditional tools, materials and processes of mediæval manuscript miniatures. We shall be creating these and similar ones on the three-day intensive course I’m teaching in Kent, UK, on Saturday 27th May, Sunday 28th May and Monday 29th May 2017. Contact me through my website for more details. There is more about the previous course I ran here. This is the little miniature that I took with me when I went to teach and talk at Harvard in October 2016 to show the various stages in creating a mediæval miniature. 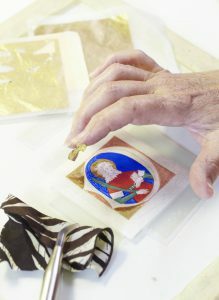 Here I’m about to apply a piece of loose gold to the pink raised gesso. More on how I did this here. I use quills a lot, and also demonstrate how they are cut to conferences and at talks, so I have quite a few! There are goose and swans’ feathers here. I also have rolls of vellum in store ready to be used. 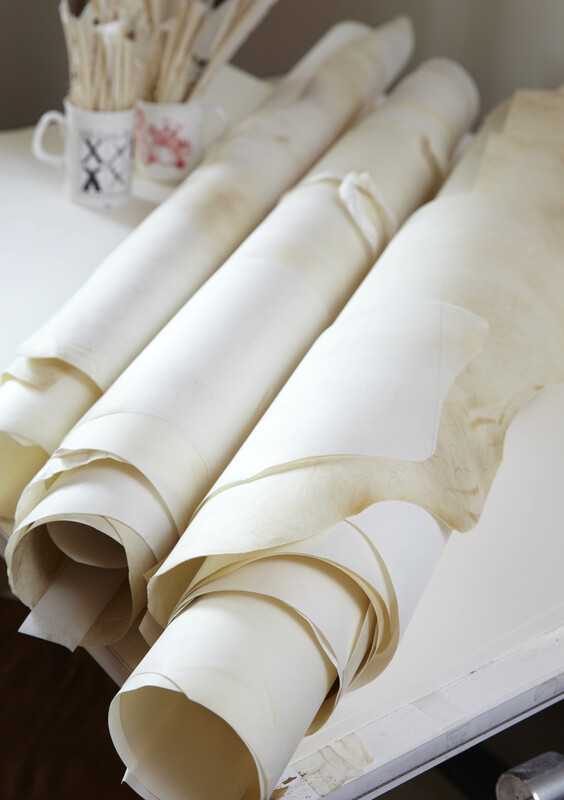 For the difference between parchment and vellum and lots more information, and another special offer on vellum and parchment for subscribers to my newsletter, click here. Although I don’t teach egg tempera painting in classes any more, I do still demonstrate how to change the powdered pigment as here into usable paints with egg as the adhesive. 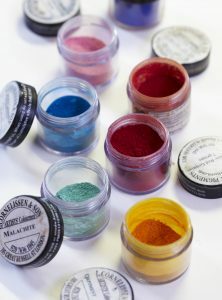 Cornelissen in London stock traditional powdered pigments in cute little jars. The colours are amazingly strong! If you want to know how to make egg tempera paint from pigments then it is shown and written about in my DVD on Illumination and also in my book Illumination – Gold and Colour. More details here. The one at the front right is orpiment. For more on a pigment that glisters but isn’t gold, see this blogpost. I was about to teach a course at the Fitzwilliam Museum when Kerry and Sussie visited, and always aim to take with me the names of the people on the course written out calligraphically so they have a memento to take home with them from the day as well as the work they’ve done. As I was writing out the names for the course, I included one for Kerry and Sussie too as a thank you to Sussie for making what I do look so wonderful, and to Kerry for writing such a fantastic piece on me. And Hurray for Landlove and their inspired editor! This entry was posted in Blog, Calligraphy and lettering, Craft, Interesting stuff and tagged A festive piece, calligraphy, calligraphy pens, Craft, Harvard, heritage craft, illumination, Kerry Fowler, Landlove, Landlove magazine, lifestyle magazine, medieval miniature, medieval miniature course, Sussie Bell on 15 January 2017 by Patricia. Occasionally, just very occasionally, a project somehow seems to work without a great deal of effort, and this is what happened with this piece. I was asked by Landlove, a UK lifestyle magazine, to have ‘a festive piece’ ready to be photographed for their Christmas 2016 issue, when they were running a six-page piece about me. This was at the end of September, and thoughts were not turning to Jingle Bells! 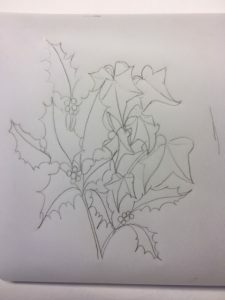 On a walk in the woods I saw some ivy trailing over a tree, and pulled a strand off, and a few steps away was a holly tree. This reminded me of the Christmas carol ‘The holly and the ivy’, and I thought that I could perhaps do something with this. 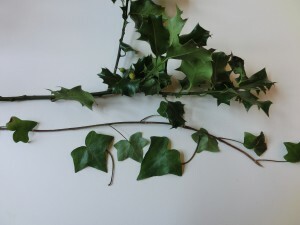 I cut a few twigs of holly and took them and the ivy back to my workroom so that I could paint them. 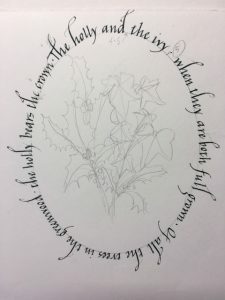 I had the idea of a circular design, with the words going round in a circle and the greenery in the middle. 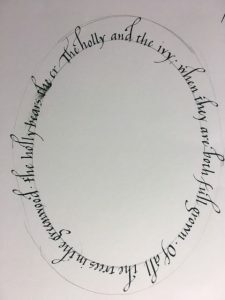 I wrote out the words using a small nib (Mitchell size 5) and checked on the guidelines in one of my books – The British Library Companion to Calligraphy, Illumination and Heraldry (available from my website here) – on how to measure a circle to fit the text. I knew what to do but couldn’t find any compasses! So I found a stencil for ovals, and decided to change my design (such trivial reasons can change designs in this way!). 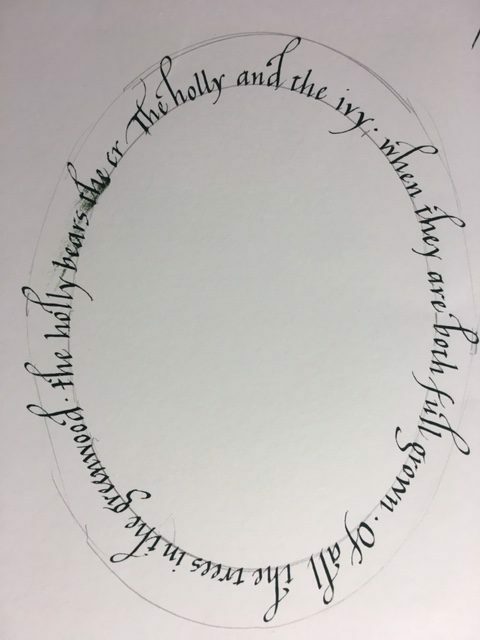 Not knowing how the words would fit I chose a size of oval that somehow looked about right, and started to write. The easiest way of dealing with the words would be to start at the top centre point of the oval, but I wanted the words in the first line to be obvious and sort of ‘straddle’ the top curve. Without really knowing where to place my pen, I started where I thought it was about right, and wrote around the line of the oval. Amazingly, the words fitted! I really couldn’t believe it, but there were some adjustments needed, with gaps where there shouldn’t be and a bit of bunching elsewhere. Also, the first line of the Christmas carol wasn’t placed evenly along the top curve and required a bit of tweaking. Using the holly and ivy that I’d brought home, I used a pencil to draw holly and ivy inside the oval, trying to create a balanced design. I wrote it out again, starting a little further to the right for a better balance of the first line, but this time I ran out of space. I should have written it again, but didn’t have the time, so I knew that it was a deep breath and hope situation! Usually the calligraphy should be completed first, as it’s easier to correct painting than it is lettering, but I had been doing a lot of calligraphy, and I wanted to do some painting for a change. I prepared the vellum skin and transferred the design using Armenian bole paper as carbon paper (see my Illumination book and DVD). I then reinforced the design with very dilute red gouache, and finally started painting. 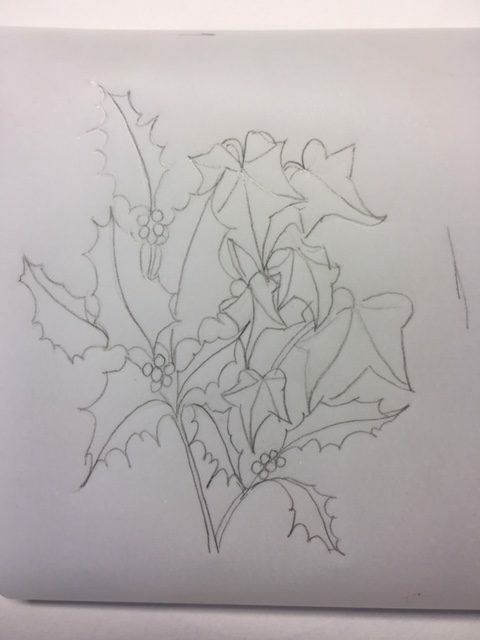 Once the design was in full colour, I realised that there was a bit of a gap on the bottom left, so I added in some more holly leaves to remedy this. Then it came to the writing. Really I should have written this out again to ensure that the words would fit, but I was really pushed for time. 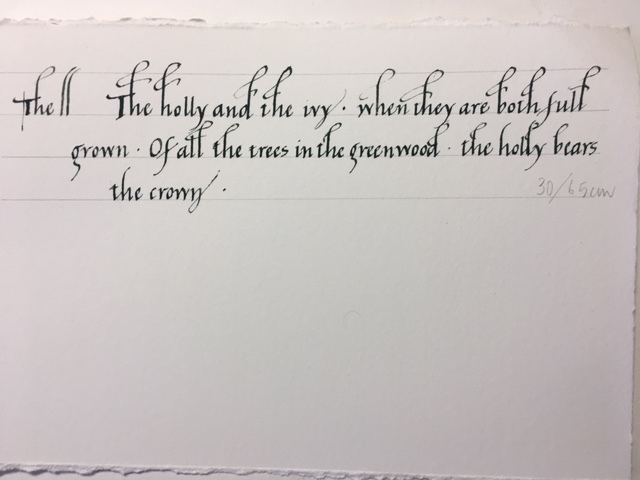 I placed the vellum over the first effort, adjusting the starting point so that the first line would be balanced, and lightly traced through, tightening up the spacing where I thought it was a little loose. It seemed to fit, and I decided to just trust to luck and a following wind! 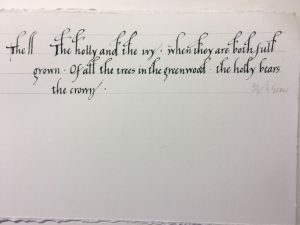 I cut a quill to approximately the same nib size, mixed up Schmincke Calligraphy Gouache to make a dark green, and, with a deep breath, just went for it. I really couldn’t believe it when the words seemed to fit and looked even all the way round. I tidied up the lettering and the painting and then the piece was ready to be photographed by the magazine. 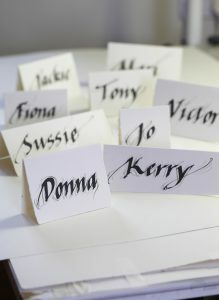 I also had some cards printed to use for our Christmas greetings card this year – spoiler alert! 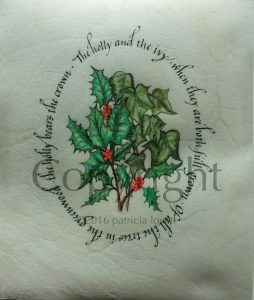 This entry was posted in Blog, Calligraphy and lettering, Lettering, lettering and tagged A festive piece, holly, ivy, Landlove, lettering on vellum, The holly and the ivy, vellum painting on vellum, writing round an oval on 5 December 2016 by Patricia.